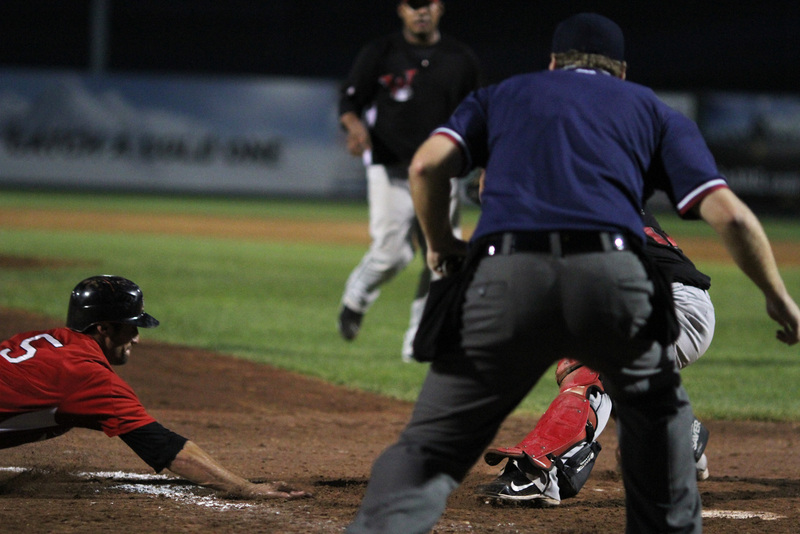 The Explorers lost to the Wichita Wingnuts by a score of 3-5. Even though “our” team (“our” only because it’s an Iowa team) lost, we still had a great time. We had first-row seats just a hair to the third base side of home. Friday night was the first time I experimented with a dSLR camera to take action shots of a sport event. While the net behind home plate protected us from foul balls, it also provided a challenge for taking photos. For my first time out, I’m pleased with the photos, and with what I learned regarding action shots. 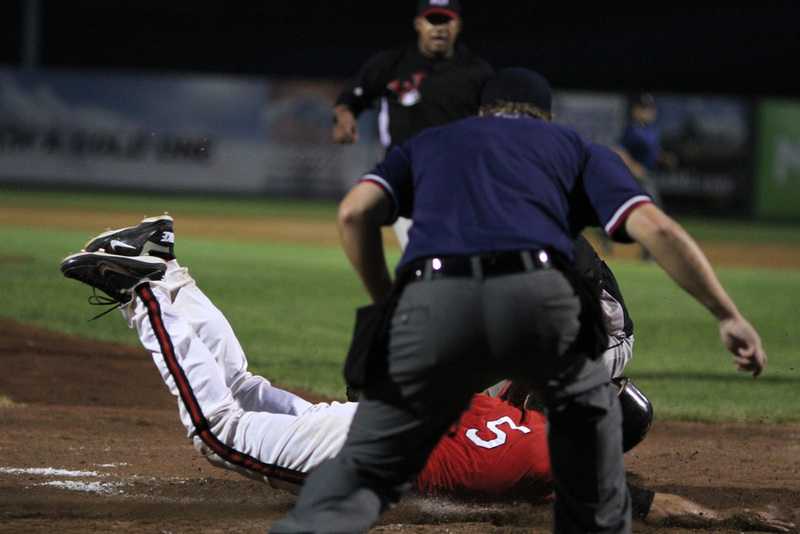 According to umpire Lance Vaughn, in the following series of photos Sioux City’s #5 Ryan Priddy was “out.” This was after the umpire apparently called Priddy “safe.” You can imagine the uproar by the crowd (a very sparse crowd) after the final ruling. The second photo shows the edge of the catcher’s glove about waist-high just to the left of the umpire. It seems unlikely that the runner was tagged in time. The article at this link reports the umpire said Priddy never touched home plate. Hmmm. Last summer Bill and I went on our own mini-baseball tour, watching four minor league teams in as many evenings. While we had a fun, relaxed time Friday night watching the Explorers, between last summer and this summer, the atmosphere of the Burlington Bees remains our favorite. 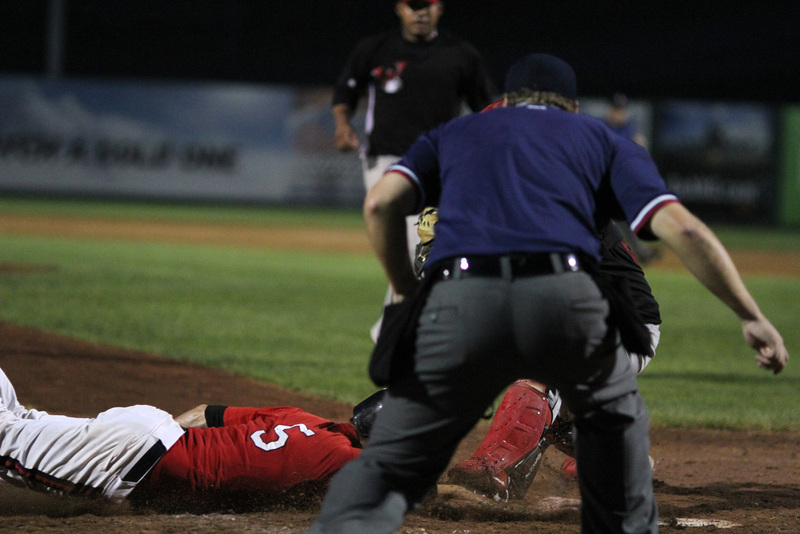 Sioux City's #5 Ryan Priddy is sliding into home. Click on photo to enlarge. The catcher's glove is about waist-high just to the left of the umpire's torso (i.e., between his shirt and his elbow). The umpire ruled Priddy was "out" saying he never touched home plate. Click once on photo to enlarge. Twice to enlarge even more. The Sioux City runner's torso is over home plate. Click on photo to enlarge. Photo info for all three photos is as follows. Shutter: 1/1600; aperture: f/2.0; focal length: 135mm; ISO: 3200. I first focused on home plate. Then, before the play, I switched from auto-focus to manual so as to maintain the same focus throughout the anticipated play at home. This entry was posted on August 7, 2011 at 2:08 pm and is filed under Uncategorized. You can follow any responses to this entry through the RSS 2.0 feed. You can skip to the end and leave a response. Pinging is currently not allowed. Is the catcher’s glove the yellow thing inside the umpire’s elbow and a little above the umpire’s belt? In hindsight, do you wish you’d had your camera a few times at Perry HS softball games? Even if you were right, that wouldn’t do much good. The ump is always right, right?! Hi Clara — Yes, the catcher’s glove is that yellow-ish thing. As a result of your question, I edited the photo caption. Thank you for asking. And, yes and no about wishing I had my camera sometimes at Katie’s high school games. It is such a Catch-22 to have a camera. I’m so glad to still have all of the video from her games at Drake, but then of course, I was behind the camera and missed some things. One time when I mentioned to a friend that I felt maybe I should be doing more…in terms of what, I don’t know…he told me that I can “give back” to people through my photography. So, I’m hoping that as I keep learning about photography, that maybe I can do some of what he said. It takes me so many shots to get something I feel remotely good about, but when those shots occur, I am pretty excited. And, yes, the ump is always right, ummmm, theoretically! Louise, great photos, good story. I used to film all of Kev’s football games and understand completely the dilemma between wanting to watch but wanting to record.